The crux of the issue is, what are the features than ordinary mortal humans can describe that will lead us back into the abyss of deep time? What are the objective features that the subjective mind will accept as valid, even though they leads us into a world that is not just unknown but also alarming, perhaps even terrifying. When you let your mind flow over all of the ways in which humans strive to avoid the certainty of time flowing toward its inevitable consequence you can appreciate that this is a significant problem in the psychology of understanding. The ease with which mathematical skills of the simplest sort enable us to count without limit is misleading. The finite human understands in the marrow of the bones that you cannot in an actual lifetime count that high, that the mathematical expression is a metaphor for something that can not physically exist. Do not underestimate the difficulty of this issue. The cloud patterns, the clots of ice in the sea, the fractured corner, are all within a familiar range of time. The iceberg itself seems more permanent. Did the ships captain know that it was here from seeing in on the prior trip? It is possible, for he navigated to it effortlessly. What can we describe about it? The simplest thing is size and shape. You can get a fair picture of that from the photo. We cruised along here for perhaps 5 minutes, not coming too close. The part we can see was the same size order as the ship itself. Of course, we “know” from the physics that nine tenths of the iceberg is below water line, out of sight. As with all geologic evidence, the evidence here is fragmentary. The shape is higher at the two ends, with a swale or valley like form through the middle. The further end is corrugated, but in the swale, the corrugations fade into a smooth surface. The closer end terminates abruptly in surfaces that drop straight down to the water line. The form below the water line is completely unknown to us. To the trained eye of the geologist, the corrugations present no problem. This form is the familiar one of upturned edges of sedimentary layers exposed by erosion. With only a little imagination, you can see the layers which run across the width of the iceberg and are tilted down away from you- dipping we would say in geologese. The layers extend across the iceberg, under the smooth part, as this view from a little further on shows. You can see the subdued expression of the layers on the further side of the swale. Layered icebergs are not at all uncommon. There are many photos on the Internet, some quite striking, particularly if some of the layers are composed of volcanic ash. The historic question is:”Is the form it has now the same as the form it had when it originated?” Sometimes the answer is yes, sometimes no. If we were looking at a highly perfect crystal of ice, or quartz or diamond, we could work our way through the appropriate theories from physics and chemistry to a safe conclusion. The form that crystals of these minerals have is a direct expression of the rules governing how atoms combine in the solid state, and we can confirm this by conducting actual experiments in the present. When we see examples of these minerals that we don’t make in the present, that come out of the past, we can conclude that they formed originally by the same chemical processes. Unless , of course, the rules of physics and chemistry have changed over time. But in the only experience we have with actually looking backward in time- by looking outward in space to the stars and galaxies- we see the rules of physics and chemistry being upheld deep into the past. Our experience tells us the rules have not changed. But this approach does not help us with the layers that underlie the corrugations seen in the Ilulisaat Iceberg. Not that they were of very much interest or concern to my fellow passengers. Questions about the zones of blue ice within the icebergs attracted much more attention. Did the layers we see tilted now form that way? What do we know about ice forming in layers? Well, we know that when water freezes in an ice tray in a freezer, the cubes don’t come out layered. If we interrupt the freezing by looking at the partially frozen state, the the water is apparently freezing from the surfaces inward, top bottom and sides. Not much help for the iceberg picture. But we have had the experience, directly or indirectly, of seeing icebergs form by the breaking off of masses from glaciers where they enter the sea. So it is pretty direct to conclude that the layering was there in the earlier glacial ice. Has anyone ever seen glacial ice form? Well, yes and no. Ice falling from the sky in the form of snow is a common observation. The accumulation of snow during a season, and the changes that take place as the newly fallen snow compact, melts partially and re-freezes are also matters of common experience, particularly for people who deal with snow on a practical, day to day basis. I suppose the whole process would be mysterious and incomprehensible to a native Samoan or Fijian, but not to a Finn or Inuit. Imagine yourself, as a scientist, sitting down with a Finn and a Fijian and an Inuit and a Samoan and trying to develop some common understanding of how layers of glacial ice could form! When you can put your mind around that situation, you are ready to start teaching in a community college. Humans have studied the process, both from a day to day pragmatic way (Inuit) and in a more academic way. Greenland has been available to European scientists for some time. Alfred Wegner, of Continental Drift fame, was, in fact, a serious student of the Greenland ice, perishing on the ice in the course of his studies. Snow lands on the surface, usually a surface composed of earlier fallen snow. That’s not actually correct. Statistically, most of the surface of the Earth being ocean, most snow must fall on the sea-surface, as it is with most rain. But being a land-centered culture, we usually ignore that fact. The land falling snow tends to move around a bit before settling down. The human metaphor is apt. The “winds of fate” will move the snowflakes around, allowing them to settle (move downward in response to gravity) only in low places that are out of the wind. Note the dynamic: the turbulence of the wind will move the snow from places where it is strong to places where it is weak. The result is the accumulation of snow in low places, sheltered from the wind. The result is a smoothing and leveling of the surface. The wind stops. The skies clear and the Sun comes out. That is, the season changes. The accumulated snow compacts, melts partially, re-freezes, and the smooth level surface is crusted over, awaiting the next episode of snowfall. To the trained eye, the boundary between successive snowfalls will be discernible. As the patterns of seasons changes, leading to more dramatic differences between layers, more obvious layering will be expressed. The ice in the Greenland Ice Sheet is observed in coring operations to be layered. The processes that can lead to this form characteristic are also matters of observation, as just described. So both the form and the process are matters of observation, but seeing the process produce the form in actual time is not. It takes too long! Thus the yes and no of the answer. Snow layers, turning to ice, accumulate somewhere on the Greenland Ice Sheet. The ice , moving plastically under its own weight, flows outward toward the coast, bearing the layers along. At the sea’s edge, a piece breaks off and floats away, the level layers being rotated in the process. 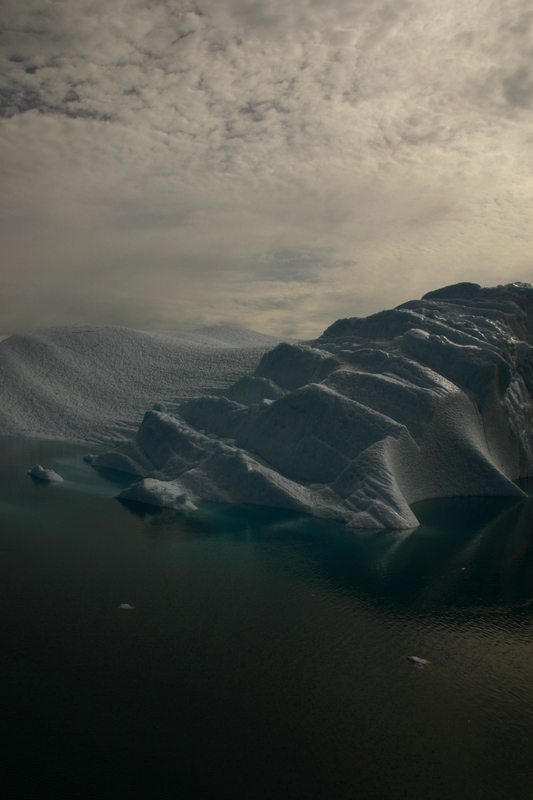 The submerged part of the iceberg interacts with sea-water, etching out the layers. The emergent part is abraded and smoothed. As the berg melts and fractures with time, it becomes flotationally unbalanced and rotates, exposing the corrugated part from below the water, the swale at the waterline and the smooth part above the water line. The expedition ship comes along and I take my picture. It’s a nice little story. It may even be about right. But likely it is wrong, at least in some way. But right or wrong, it does lead the subjective mind into a deeper abyss of time. How long did the story take? For how many days or weeks or months has the Ilulisaat Iceberg been on the captains tour-guide? If it did rotate, as I have proposed, when did that happen? Was it before or after Wegner perished on the Ice Sheet? How many years ago did the berg break off from the glacier? Was that before or after Europeans came to Greenland. How long did the slow journey from the interior to coast last? Centuries? Millennia? How does that compare to the time required for the layers to form. Backward from the present we creep into the past, a past that may not include us, and that portends a similar future.